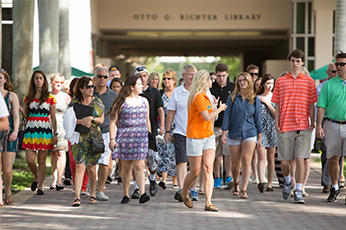 Campus tours are led by members of the President's 100 organization (affectionately known as 'P-100s'). They'll take you through our schools/colleges, around the University Center (StudentUnion) and inside one of our residential colleges (dorms). Our P-100s are happy to share their experiences with guests. Continue reading about our President's 100 and find out what is required to become member!